"Avoid obstacles by following the rhythm of the music!" Game Goal: You must help Kaito and Aya by traveling through their dreams on a skateboard, avoiding all kinds of obstacles. How to Play: You have to dodge vehicles and objects which are directed towards the player. You must also stay in time as all of your actions combine alongside songs. 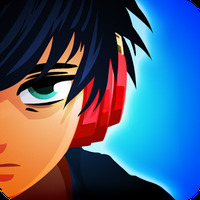 Game Options: You can play alone to overcome all levels or create your own Playtracks with your favorite songs in the level editor to share scores and compete against your friends and other users. Game play: There are 30 different environments.Some of the obstacles you must tap on the screen to keep up, you can also customize clothes, your skateboard, and your hat. Languages: English, Spanish. Italian, German among many others. Ranking: The TOP 5 Most downloaded games in Skateboard Games category. It is original and creative. You can create your own levels with your music. All of the songs are synchronized with the levels. Uses a lot of memory. Only the first 4 levels are free. Do you like Lost in Harmony?